Australian mining companies have recently purchased 1,151,494 ha of mining concessions, many of them inside mega-diverse rainforests, including the headwaters of the Amazon, and the critically endangered cloud forests of north western Ecuador. 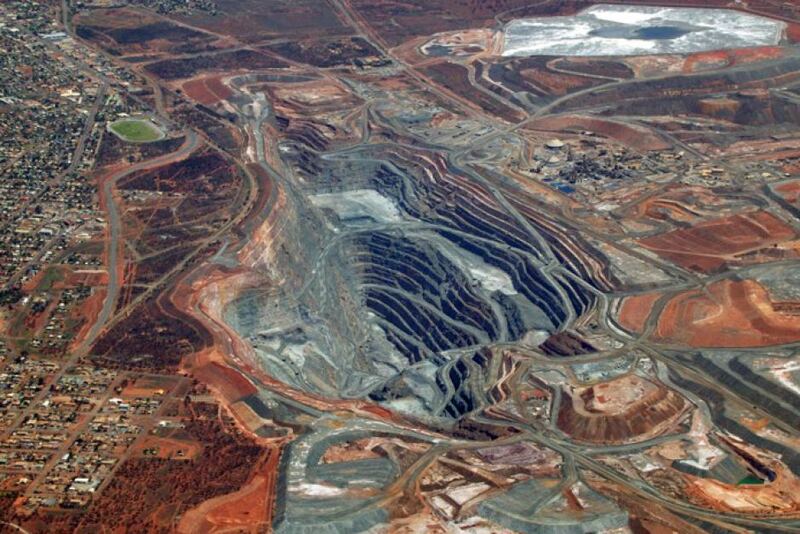 Around 894,80 ha of protected forest reserves and 131,514 ha indigenous territories are also threatened by large Australian mining companies, including BHP, Fortescue, and Newcrest. 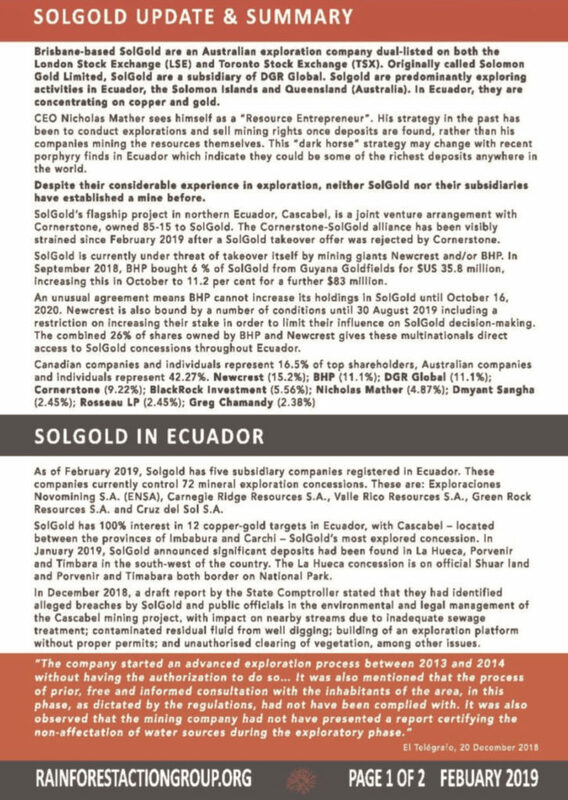 SOLGOLD AND ITS SUBSIDIARIES OWNS AROUND 772,613 HECTARES, OR 67% OF ALL AUSTRALIAN MINING CONCESSIONS IN ECUADOR. 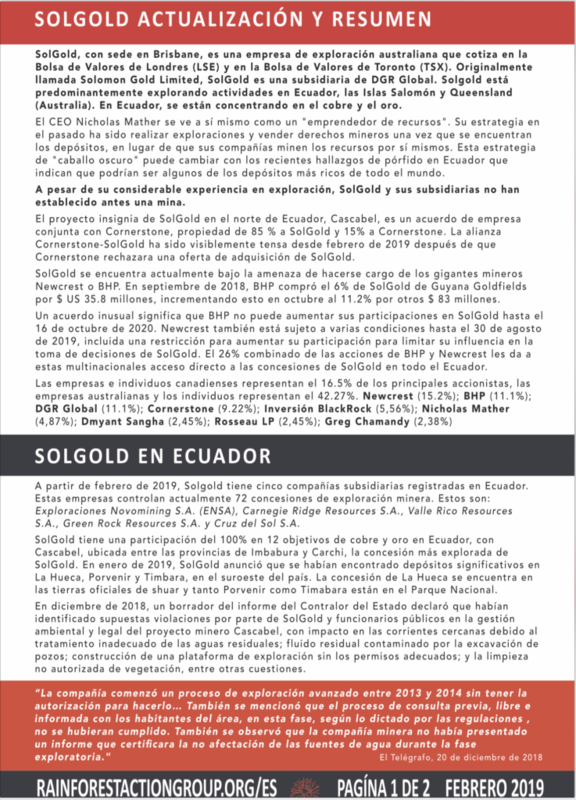 As of February 2019, Solgold has five subsidiary companies registered in Ecuador. These companies currently control 72 mineral exploration concessions. These are: Exploraciones Novomining S.A. (ENSA), Carnegie Ridge Resources S.A., Valle Rico Resources S.A., Green Rock Resources S.A. and Cruz del Sol S.A.
SolGold are an Australian exploration company currently registered in the UK and Canada. A subsidiary of DGR Global, the company was originally called Solomon Gold Limited. Their exploration activities are focused in Ecuador, the Solomon Islands and Queensland, Australia. In Ecuador their interest is primarily in copper and gold. Current directors include: Nicholas Mather, Robert Weinberg, Craig Jones, John Bovard, Bryan Molller and Canadian James Clare. Current top ten shareholders of Solgold are: Newcrest (15.2%); BHP (11.1%); DGR Global (11.1%); Cornerstone (9.22%); BlackRock Investment (5.56%); Nicholas Mather (4.87%); Dmyant Sangha (2.45%); Rosseau LP (2.45%); Greg Chamandy (2.38%). Canadian companies and individuals represent 16.5% of top shareholders, Australian companies and individuals represent 42.27% of shareholders. 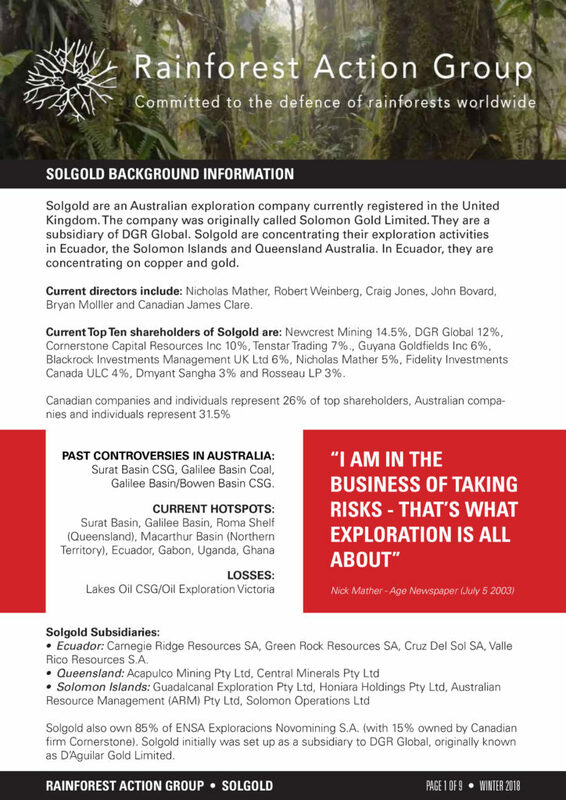 Detailed information on SolGold and its global operations.